Within days, Australians will get to see the first of the RAAF’s new Joint Strike Fighters—just months after the jet’s noisiest critics told an inquiry it was a ‘jackass of all trades and masterful of none’. Two members of the Air Power Australia group went on to tell the Senate committee the aircraft was ‘a broken and obsolete design, unsuitable for modern combat’. The reality, say Australian fighter pilots and senior members of the ADF with intimate knowledge of the JSF’s capability, is vastly different. The JSF remains a work in progress, but by the time the RAAF buys its aircraft, the next design and software upgrade should be complete and the F-35s will be significantly more capable than Hornets or Super Hornets. Air Marshal Davies says the results of the intense Red Flag air combat exercise in the US ‘absolutely cement our view that this is the right aeroplane for Australia.’ US media is talking about a 15:1 kill ratio in favour of the F-35  against older generation fighters in the exercise in which RAAF air crews took part. (Though some commentators have raised questions  about the significance of that figure. )The officer responsible for the Australian end of the US-led multinational JSF program says the aircraft will revolutionise the way the nation fights wars far into the future. 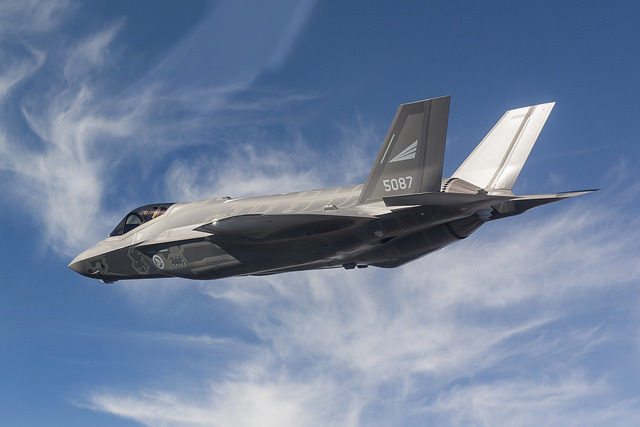 The head of the RAAF’s JSF Capability and Sustainment Group, Air Vice Marshal Leigh Gordon, says four factors give the F35 its ‘fifth generation’ edge—stealth, sensors, fusion and data sharing. Air Vice Marshal Gordon is confident that the first of the 72 JSFs on order for the RAAF will be based in Australia by December 2018 and the first operational squadron and a training squadron will reach IOC by December 2020. Three squadrons will be fully combat ready in 2023. Group Captain Glen Beck has been a fighter pilot all his adult life and is now director of the RAAF’s Air Combat Transition Office. He served in Iraq in 2003 as a flight commander and he’s trained many of the RAAF’s top pilots. The aim, he says, isn’t just to see aircraft delivered and hangers built for them but to get to a mature and self-sustaining system with fully trained pilots ready for operations. ‘With F-35 we are on a massive learning curve.’ He says RAAF specialists deeply embedded in the program in the US are well placed to identify any problems with the JSF. Two RAAF pilots are in the US instructing international pilots to fly the JSF and three others are training there to become instructors. The JSF is designed for what the pilots call ‘BVR’—beyond visual range—combat but the Australian pilots say it can dogfight as well. Getting the pair of highly advanced, ‘fifth generation’ jets to the Avalon Air Show will itself be a comprehensive demonstration of aviation logistics. They’ll be flown to Australia by Aussie pilots and frequently topped up along the way by a RAAF KC-30 air-to-air refuelling tanker. Brendan Nicholson is The Strategist‘s Defence Editor. Image courtesy of Flickr user Forsvarsdepartementet.